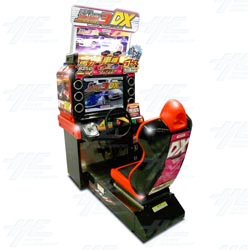 Wangan Midnight Maximum Tune 3DX arcade machine from Namco Bandai is an updated version of Wangan Midnight Maximum Tune 3. The update brings with it 4 new cars including the Mitsubishi Lancer Evolution X and the Subaru Impreza WRX STI. A new course, Nagoya High speed ring, has also been added. The update also includes new music, three new stories, and new versus mode and ghost battle features. The maximum horsepower for cars has also been bumped up to 825. Wangan Midnight Maximum Tune 3DX was released on December 16, 2008.